We want to thank everyone who came to the Handi-Quilter Pro-Stitcher Classes! It was a great 2 days of learning what you can do with the Pro-Stitcher. Thank you to Diane Henry and Handi-Quilter also. We also want to send a very big thank you to Lisa Furleigh of Quilting in the Valley of LaSalle, Illinois for bringing your ladies here to visit. We loved hosting you and your friends. Check out all the pictures of both events on our Facebook page. Our sale fabric is now $6.00 per yard with a 1 yard minimum. Come and get ‘em before they go up again! Next Tuesday all sale fabric will be $7.00 per yard. We have been asked to have an English paper piecing class. Carol Walp will be the instructor. We are hoping to have this class in November. It will be a 2 hour class of the basics and you will make a pin cushion. If you are interested, please call the shop to let us know. The maximum number of people is 10. Class and kit pricing to follow. We are working “feverishly” on the 2018 “5 County Holiday Shop Hop – Snowman Shuffle! !” We are excited and can’t wait for you to see what we have come up with for our project. The dates are November 29th, 30th and December 1st. Hours are 9-5 all three days. Passports are available for $5.00 each (day of passports will be $6.00) Your passport will include a coordinating applique pattern. When you have completed the Shop Hop, turn in your passport to be eligible for the Grand Prize of 5 - $50.00 gift certificates! Each shop will also give away a Gift Basket valued at $100.00. October 31st – Sit ‘n’ Sew—come if you dare on this Halloween Day 1-4 p.m.
November 3rd – UFO Club – 10 – 2 p.m. Come in and bring those projects you’ve had laying around for some time and get them finished!! 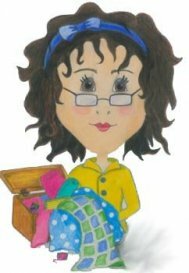 November 10th – Sharynn’s Stitching Friends – 9 a.m. Bring in your Show ‘n’ Tell. We love to see all the projects you have done! We have such talented gals!! Have you been thinking that you might like to try a longarm quilting machine? Come in and talk to Darrell. We carry the best….Handi-Quilter. It really is amazing what these machines can do! Darrell will walk you thru it and if purchased, he will set it up and teach you how to use it. We have classes 2x per year to help you. Darrell works here full time and is available to clean and service all the machines we sell. We sell only Janome sewing machines and have for 21 years! Come see us for all your sewing needs.